Each fall, hundreds of millions of monarch butterflies migrate from the United States and Canada to mountains in central Mexico where they wait out the winter until conditions favor a return flight in the spring. The monarch migration is truly one of the world's greatest natural wonders yet it is threatened by habitat loss at overwintering grounds in Mexico and throughout breeding areas in the United States and Canada. Milkweeds and nectar sources are declining due to development and the widespread use of herbicides in croplands, pastures and roadsides. Because 90% of all milkweed/monarch habitats occur within the agricultural landscape, farm practices have the potential to strongly influence monarch populations. Development (of subdivisions, factories, shopping centers, etc.) in the U.S. is consuming habitats for monarchs and other wildlife at a rate of 6,000 acres (9.4 square miles) a day - that's 2.2 million acres each year. This is roughly equivalent to losing an area of habitat the size of the state of Illinois (the 24th largest U.S. state) every sixteen years! Widespread adoption of herbicide-resistant corn and soybeans has resulted in the loss of more than 100 million acres of monarch habitat in recent years. The planting of these crops genetically modified to resist the non-selective systemic herbicide glyphosate (Roundup) allows growers to spray fields with this herbicide instead of tilling to control weeds. Milkweeds survive tilling but not the repeated use of glyphosate. This habitat loss is substantial since these croplands represent a significant portion of the summer breeding area for monarchs. The use of herbicides and frequent mowing along roadsides has converted much of this habitat to grassy areas that lack shelter and food for wildlife. Although some states have started to increase the diversity of plantings (including milkweeds) along roadsides, these programs are small. Unfortunately, the remaining milkweed habitats in pastures, hayfields, edges of forests, grasslands, native prairies, and urban areas are not sufficient to sustain the large monarch butterfly populations seen in the 1990s. MONARCHS NEED OUR HELP. To offset the loss of milkweeds and nectar sources we need to create, conserve, and protect monarch butterfly habitats. You can help by creating "Monarch Waystations" (monarch habitats) in home gardens, at schools, businesses, parks, zoos, nature centers, along roadsides, and on other unused plots of land. Creating a Monarch Waystation can be as simple as adding milkweeds and nectar sources to existing gardens or maintaining natural habitats with milkweeds. No effort is too small to have a positive impact. Be sure to register your habitat(s) and encourage others to follow in your footsteps! By creating and maintaining a Monarch Waystation you are contributing to monarch conservation, an effort that will help assure the preservation of the species and the continuation of the spectacular monarch migration phenomenon. Size. A suitable Monarch Waystation habitat can be easily integrated into an existing garden. There is no mimimum area requirement in order to certify your habitat; however, a truly effective Monarch Waystation will be at least 100 square feet. The total area may be split among several discrete sites at your location and there is no upper limit for the size of a Monarch Waystation habitat. Exposure. Butterflies and butterfly plants need lots of sun; therefore, Monarch Waystations need to be located in an area that receives at least six hours of sun a day. Drainage and Soil Type. Milkweeds and nectar plants will do best in relatively light (low-clay) soils. Good drainage is needed to avoid root rot and provide good aeration of the roots. Shelter. To assure that the maximum number of monarchs survive in your habitat, the plants should be relatively close together. However, they should not be crowded - be sure to follow the planting guides specific to each plant. All monarch life stages need shelter from predators and the elements. Planting milkweeds and nectar plants close together contributes to this shelter for monarchs and other wildlife. Milkweed Plants. To maximize the use of your habitat by monarchs, we recommend that you have at least 10 milkweed plants, made up of two or more species; however, a large number of plants (more than 10) of one species is sufficient. Milkweeds of different species mature and flower at different times during the season. By increasing the number of milkweed species in your habitat you will increase the likelihood that monarchs will utilize your property for a longer period during the breeding season. Nectar Plants. Monarchs, other butterflies, and numerous pollinators need nectar. By providing nectar sources that bloom sequentially or continuously during the season (as many butterfly plants do) your Monarch Waystation can provide resources for monarchs throughout the breeding season and the migration in the fall. A Monarch Waystation should contain several annual, biennial, or perennial plants that provide nectar for butterflies. Management. You should have a plan to sustain a Monarch Waystation. Specific actions you take will depend on the features of your habitat; however, some general examples include mulching, thinning, fertilizing, amending the soil, removing dead stalks, watering, eliminating insecticide use, removing invasive plant species, and incorporating additional features. When planning the restoration of large areas, it is important to plant milkweeds that are native to your region of the country. This is not as crucial in a backyard or schoolyard garden; however, native plants typically require less maintenance and offer a greater benefit to local wildlife. 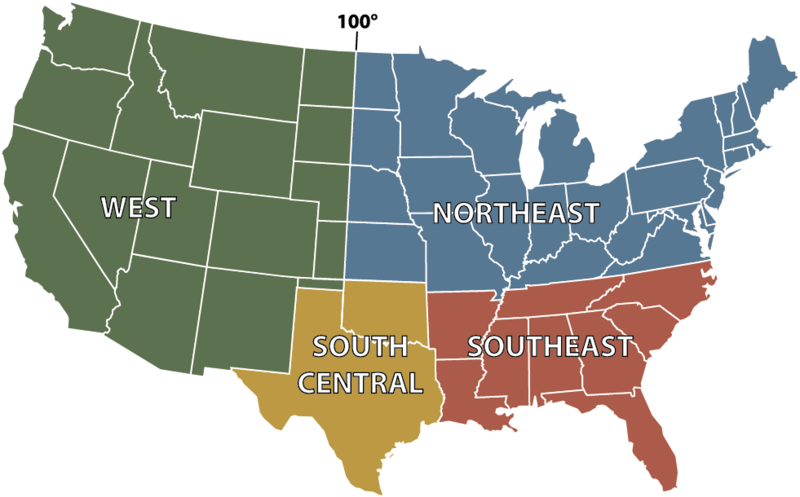 Please visit Monarch Watch's Milkweed Market for a more detailed map as well as resources for purchasing native milkweeds appropriate for your specific ecoregion. You may also be interested in our milkweed grant programs that provide free milkweeds for restoration projects or free milkweeds for schools and educational non-profits. 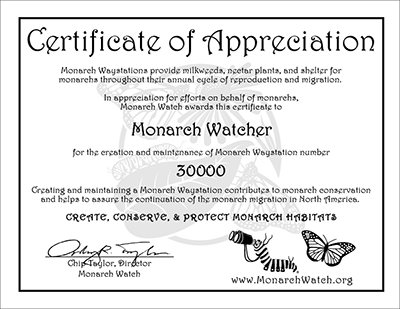 To show your support of monarch conservation, you can have your monarch habitat certified as an official Monarch Waystation by Monarch Watch. Your habitat will be included in the Monarch Waystation Registry, an online listing of Monarch Waystations worldwide, and you will be awarded a certificate bearing your name and your habitat's unique Monarch Waystation ID number. 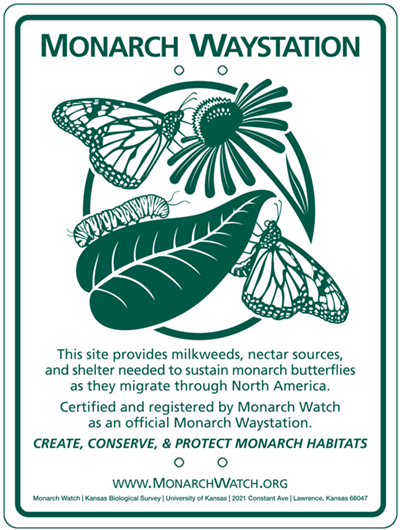 You may also choose to purchase a metal sign that identifies your monarch habitat as an official Monarch Waystation. This display helps convey this important monarch conservation message to all those who visit your habitat and may encourage them to create their own Monarch Waystation. 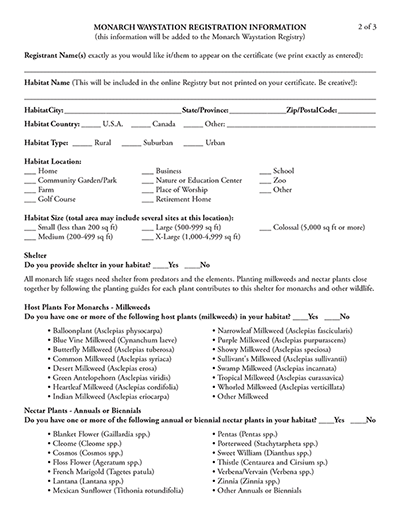 You may also download a Monarch Waystation application for offline completion and submission via mail or fax. To view a larger map of Monarch Waystation habitats (as well as the complete registry) please visit the full Monarch Waystation Registry. As noted above, in most cases the mapped location is based only on city, state, and/or zip code data - so the precise location of the habitats may not be available (due to privacy considerations). You can apply filters to the full registry data set to display any subset you'd like (based on id, city, state, size, etc.) and only these records will be listed or mapped. The default view of the Monarch Waystation Registry is an overview map of the registered Monarch Waystations (a larger verion of the map above). Click on the "Registry" tab located next to the "Map" tab in the Monarch Waystation Registry to see the registry listing. To locate a specific habitat or group of habitats, click on the blue "Filter" button to get a drop-down list of attributes. Many of these can be used to find Monarch Waystations in the registry. • To search by your Waystation's ID, select "ID" from the drop-down. • To search by your Waystation's certification date, select "Certified" from the drop-down. • To search by the name(s) of the registered owner(s) of your Monarch Waystation, select "RegistrantName" from the drop-down. • To search by the name of your Monarch Waystation, select "HabitatName" from the drop-down. • To search by the zip code of your Monarch Waystation, select "HabitatZip" from the drop-down. Once you have clicked on the value you want to search/filter by, a box that you can type into will appear. 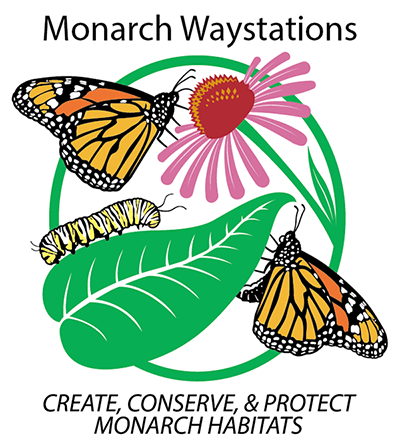 Type the relevant information about your Monarch Waystation into the box (for example, typing "Monarch Watch" for the "RegistrantName" search to find our Waystation). Your Monarch Waystation's information will appear to the right. 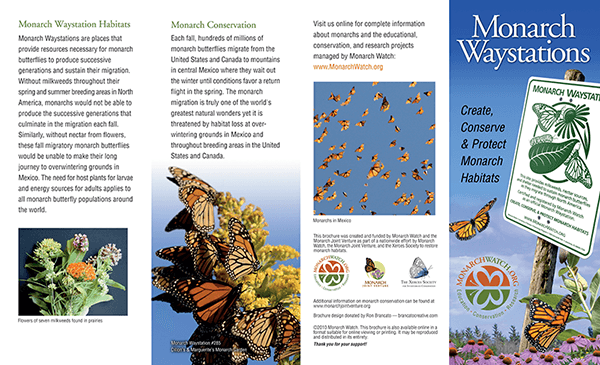 The Monarch Waystation Network is a project developed by Monarch Watch to connect and support schools who have pollinator gardens and/or incorporate monarchs into their curriculum. We aim to facilitate the use of a garden as a learning center - a center for discovery, self-instruction, and sharing of knowledge by the students. We do not intend to provide all the answers, instead we intend to guide learners to ask questions and then seek their own answers.